The Chad Valley Games company was one of the UK's leading toymakers for most of the 20th century but was taken over by Palitoy in 1978. The brand name was bought by Woolworths in 1988 and remained in use until that company's closure due to insolvency. Home Retail Group, the parent company of retailers Homebase and Argos, purchased the brand in 2009. The Chad Valley brand is now available exclusively at Argos. The pre-WW1 set shown here is one of several Happy Families games published by Chad Valley Games. It was originally designed by Max Pollock (1887-1943) but re-drawn and modernised, printed by chromo-lithography and re-published by Chad Valley Games, c.1910. 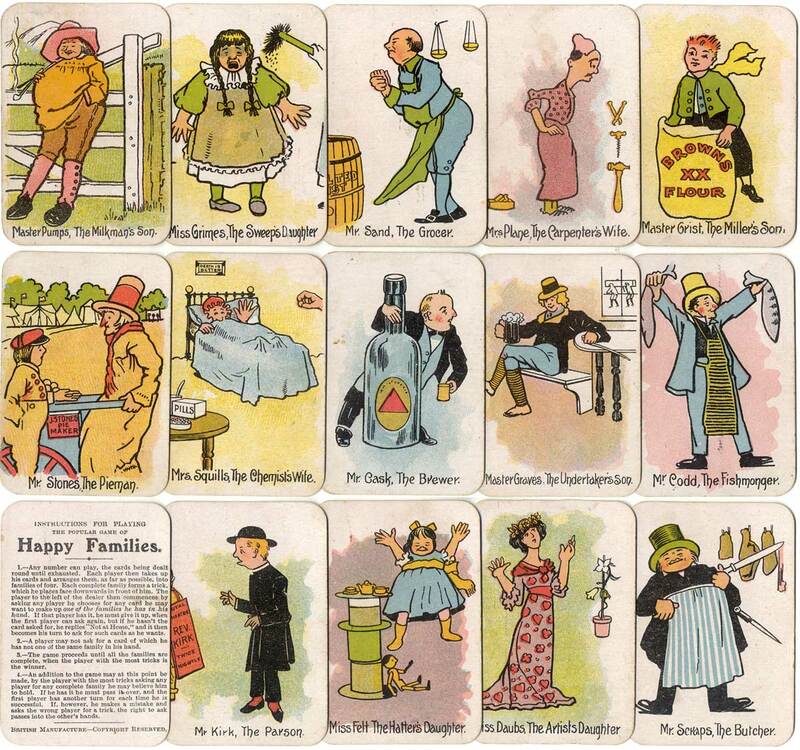 Above: cards from “The Round Card Game of Happy Families”, originally designed by Max Pollock (1887-1943) but re-drawn and modernised, printed by chromo-lithography and published by Chad Valley Games, England, c.1910. The set has sixteen families, making a total of 64 cards + rules card. Above: 1895 edition of Max Pollock's “Happy Families” showing the original drawings coloured in red, black & green. These drawings were redrawn and modernised as they had begun to look too old fashioned after the turn of the century. Images courtesy Rex Pitts.